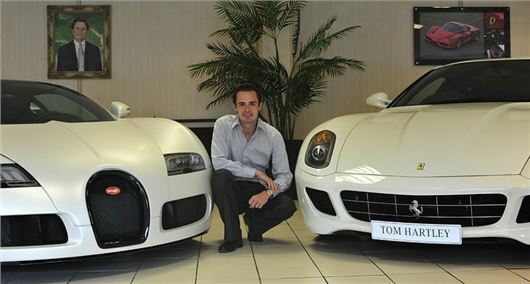 Car Dealer magazine reported that Tom Hartley Jnr has split from the family business to set up on his own after two decades of working with his father and brother. Back in the early 1990s, at home in Overseal, Derbyshire, Tom Hartley Snr asked HJ if he should put his 15 year old son through the 6th form and University, or bring him into the family business and engage a tutor for acedemic studies. HJ's answer was unequivably the latter and by his late teens Tom Hartley Jnr was already a millionaire. The new business venture, named Tom Hartley Jnr, will specialise in classic cars as this is a flourishing area of the market at present. He explained that after 20 years working for his father, Tom Hartley, the relationship isn’t tarnished despite setting up on his own. ‘Professionally speaking, this is the most amicable separation you can imagine but the time is now right for me to put my considerable experience, reputation and energy into a new venture that I can develop in a very personal way,’ said Hartley Jnr. In the last 12 months alone Hartley Jnr has been personally responsible for some of world’s biggest private ultra-rare car sales. These included a 1957 Ferrari 250 Testa Rossa sports racing car, the only right hand drive Ferrari California SWB Spider in existence, and the sale of a 1937 Mercedes-Benz W125 Grand Prix car. The new business venture will expand on this existing reputation, he says. ‘My stock represents only the best cars on the market and that is an unconditional pre-requisite of how I wish to trade and build my reputation,’ he added. The new premises have been fully operational from June 1 2014, but Google cannot find a website link.